The BM-30 Smerch (Russian: Смерч, "whirlwind") or 9A52-2 Smerch-M is a Soviet heavy multiple rocket launcher. The system is designed to defeat personnel, armored, and soft-skinned targets in concentration areas, artillery batteries, command posts and ammunition depots. It was created in the early 1980s and entered service in the Soviet Army in 1989. When first observed by the West in 1983, it received the code MRL 280mm M1983. It is expected to be superseded by the 9A52-4 Tornado. The first confirmed combat uses of the Smerch were in two war zones in 2014. 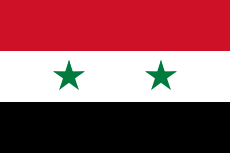 Syrian military forces used the system against rebel forces in 2014 during the Syrian civil war. It was also used by Ukrainian government forces to deliver explosive and cluster munitions to Donetsk and Lugansk cities during the War in Donbass. Several have been seen in use by pro-Russian rebels. The Russian Ground Forces used the BM-30 in Syria in October 2015 during the Russian intervention in Syria. Training facilities 9F827 and 9F840. The 300mm rockets with a firing range of 70 and 90 km and various warheads have been developed for the Smerch MLRS. reduction of the combat crew. 9A52- Standard variant on MAZ-79111 truck. 9A52-2 - Modified variant on MAZ-543M truck. 9A52-2T - Export version, based on the Tatra T816 10x10 truck. 9A52-4 - Lighter, airmobile version on KamAZ-6350 truck with modular 6-round rocket pack. Demonstrated in 2007. Algeria - 18 systems in 1999. 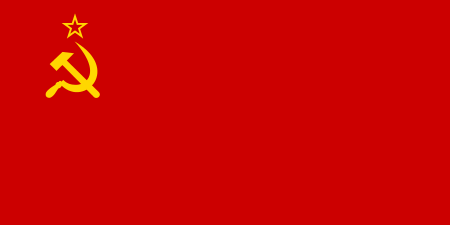 Belarus - 48 systems in 1990. 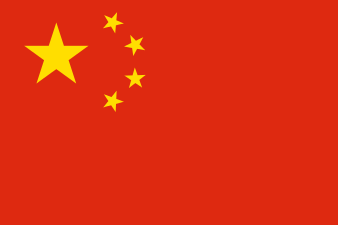 China - Locally produced as the PHL03. India - 42 9A52-2T systems in service. 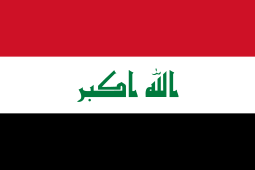 Iraq - 150 systems in 2016. Kuwait - 27 systems in 1996. Morocco - 36 systems PHL03/AR2 Chinese version. Pakistan - 200+ units, produced locally as the A-100E with complete TOT, based on the Chinese A-100, which is in turn based on the Soviet BM-30. Syria - Unknown number, used in the Syrian civil war. 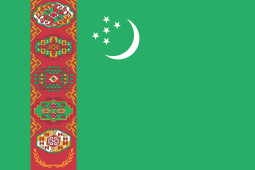 Turkmenistan - 6 systems 9A52-2T in 2008/2009. United Arab Emirates - 6 systems. 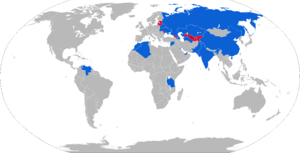 Soviet Union: Passed on to successor states. PHL96 - Aesthetically similar missile based on the Wanshan WS-2400 8 x 8 cross country truck. However, the PHL03 and BM30 do not share interchangeable parts, so they are distinct missiles despite their similar appearance. The Chinese vehicle utilizes a German-designed diesel engine, transmission and hydraulics, manufactured by Wanshan in China, following a technology transfer from ZF Friedrichshafen. The program actually begun in the late 1990s, with the '96' in the designation reportedly meaning 1996, the year that the Chinese military first issued the requirement for a new long range SPMRLS. 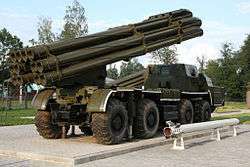 The program went through major redesign changes when the BM-30 Smerch was purchased. Although dubbed by many Chinese as a guided self-propelled multiple rocket launching system (SPMRLS), the PHL96 is not strictly speaking a guided SPMRLS because, technically, none of rockets are guided - the guidance is actually achieved via the sub-munitions, such as the 9M55K1 cluster munition. Only a very limited number of the PHL96 entered Chinese service because its successor, the PHL03, entered service shortly after. A-100 - A 300 mm, 10-tube multiple rocket launcher developed by the Beijing-based China Academy of Launch Vehicle Technology (CALT) in the late 1990s. The A-100 has a minimum firing range of 40 km & a maximum firing range of 100 km. PHL03 - Chinese development of the PHL96. The PHL03 is a highly digitized PHL96 with a computerized fire control system (FCS) incorporating GPS/GLONASS, similar to that of the Type 90A SPMRL, with a four-man crew (compared with three for the BM-30/PHL96), which entered service around 2004-2005, only a year or two after its predecessor, the PHL96. As with the PHL96, the PHL03 is not exactly a guided SPMRL because it is the submunitions that are guided, not the rockets themselves. AR-1 - Chinese development of the PHL03. This is actually the first model of the Chinese versions of the BM-30 SPMRL that is a truly a guided rocket system, in that the rockets themselves are guided by the simple primitive cascade inertial terminal guidance used on the WS series SPMRL, which became standard for later Chinese versions. Russia had already developed a guided version of the BM-30 with mid-course radio command guidance to immediately correct the error in the flight of the rocket once detected by the ballistic tracking radar, but this was not adopted due to financial constraints. AR-1A - Chinese development of the AR-1. A 10 round version of the AR-1, with two launching boxes, each containing five expandable launching tubes. Once rockets are launched, the entire launch box is replaced, instead of individually reloading each tube as in earlier versions, thus greatly reducing the reload time. A-100E - Export variant of the AR-1A. In service with the Pakistan Army. AR-2 - Chinese development of the AR-1/1A manufactured by Norinco, with range increased to 130 km. AR-3 - Chinese development of the AR-2 manufactured by Norinco, with its caliber increased to 370 mm; although it can still fire the 300 mm rockets. As with the AR-1/1A/2, the AR-3 adopts a modular design by incorporating two launching boxes containing several launching tubes, with the launching boxes replaced after the launching of rockets. When using 300 mm caliber rockets, each launching box contains five launching tubes like the earlier AR-1/1A/2, and when using 370 mm caliber rockets, each launching box contains four launching tubes. ↑ " Makeevka: Smerch". Bellingcat Vehicles. 22 January 2015. Retrieved 11 February 2015. 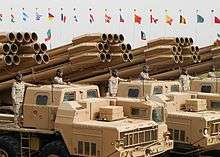 ↑ "China Providing AR2 Long-range MLRS to Morocco". Kanwa Daily News. Archived from the original on 25 September 2013. Retrieved 21 September 2013. ↑ "Type A100". Global Security. Retrieved 17 March 2016. ↑ Eliot Higgins (14 February 2014). "Evidence Of The Syrian Military Deploying BM-30 Smerch Launched Cluster Munitions". Brown Moses Blog. ↑ "Міністерство". Міністерство оборони України. Retrieved 23 December 2014. 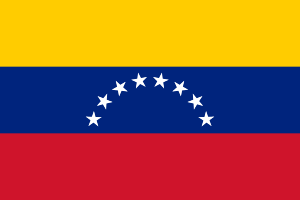 ↑ "Las Fuerzas Armadas de Venezuela reciben más armamento ruso". Infodefensa (in Spanish). 3 April 2012. Retrieved 10 April 2012. ↑ John Pike. "9A52-2 BM-30 300-mm Multiple Rocket Launcher". Retrieved 23 December 2014. ↑ "PHL03式远程火箭炮_百度百科". Retrieved 23 December 2014. ↑ "BM-30龙卷风式火箭炮系统_百度百科". Retrieved 23 December 2014. ↑ "й³ڱָȱݣʵڣ-½-½". Retrieved 23 December 2014. ↑ "AR2300Զ̻ϵͳ". Retrieved 23 December 2014. ↑ "俄媒称中国将出口最新式AR-3型远程火箭炮(图)". Retrieved 23 December 2014. 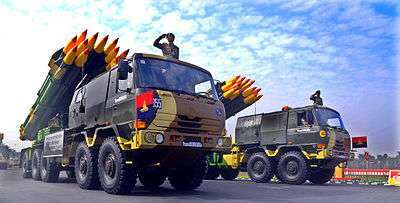 Wikimedia Commons has media related to BM-30 Smerch.